A consistent finding across these metro areas is that individuals with strong engagement in local civic and community life as well as those who give their city a high rating as a place to live display stronger local news habits. In each of the three diverse cities studied, the most engaged residents are more likely to follow and discuss local news, take part in a number of different news activities, and are somewhat more digital in their local news than residents who are less engaged. They also differ in the news sources they choose to use. 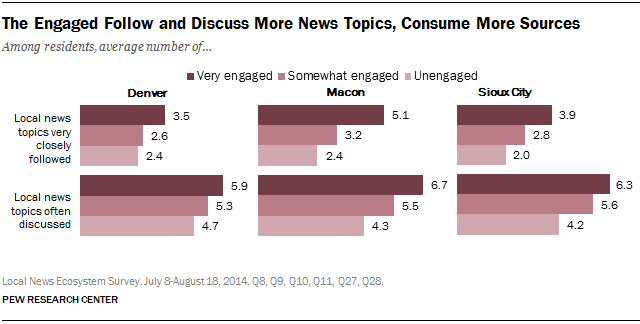 The very engaged also closely follow and discuss a greater number of local news topics. On average, the very engaged in Macon very closely follow 5.1 topics (compared with 3.2 of the somewhat engaged and 2.4 of the unengaged), 3.5 topics in Denver and 3.9 topics in Sioux City, higher than both the somewhat and unengaged in each city. In Macon, the very engaged follow 11 of the 12 topics asked about at higher rates; the same is true of eight of the topics in Sioux City, and seven in Denver. For example, across all three cities, local government, arts and culture, and schools and education are closely followed at higher rates by the most engaged. The same trend holds true when it comes to talking about news topics with other residents. The very engaged in Macon often discussed eight of the 12 topics at greater rates—from local government and politics to local development and real estate to local sports—than the somewhat and unengaged, six in Sioux City, and four in Denver. In addition to following local news more closely, the engaged are more likely to take part in a number of different news activities, including both the high and low tech. In fact, more than half of the very engaged in each city have shared a story digitally in the past year. And while the numbers overall are lower for calling in to a live radio or TV program or submitting letters to the editor, the very engaged are about twice as likely or more to do so than those less engaged. Across all levels of engagements and in all three cities, local TV is the top source of local news. In both Macon and Sioux City, about two-thirds of residents in each engagement group often get local TV news. 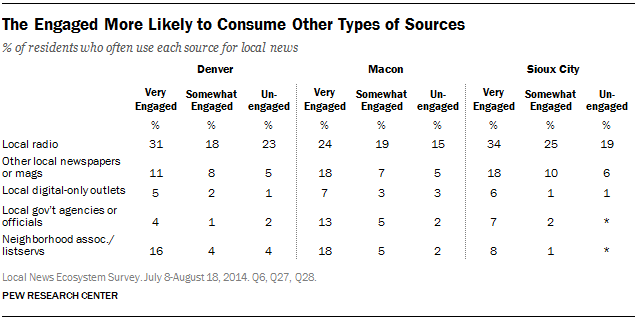 In Denver, at least half of each group often uses local TV as a source for local news. The city’s main daily local newspaper, meanwhile, is more prominent among the engaged than the unengaged. In Denver, a third (33%) of the very engaged often turn to The Denver Post, compared with 20% of the somewhat engaged and 19% of the unengaged. About half (52%) of the very engaged in Macon often use The Telegraph, substantially higher than the somewhat (33%) and the unengaged (26%). And in Sioux City, about equal numbers of the very (47%) and somewhat engaged (43%) often get news from the Sioux City Journal, compared with only three-in-ten of the unengaged. Another source for local news that stands out among the engaged is fellow residents. Across all three cities, the very engaged are more likely to often turn to other residents for local news. This especially true in Macon, where 52% of the very engaged say that they often turn to their fellow residents for local news. Other types of sources that are less frequented overall also stand out among the engaged. In all three cities, the most engaged are more likely to often turn to neighborhood associations or listservs. The same is largely true for local newspapers or magazines beyond the main daily. And, in Macon and Sioux City, while still at relatively low rates, more of the very engaged often use local government agencies and officials as local news sources. Reliance on radio news is a bit more muddied. Engaged residents in Sioux City are more likely to rely on it often than are other residents, but the trend is not as consistent in Denver or Macon. 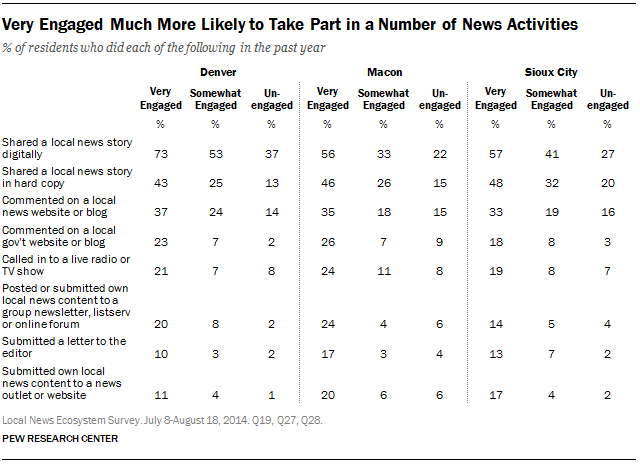 The very engaged are also somewhat more digitally focused in their local news media habits. 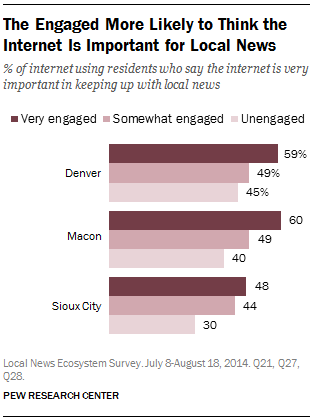 In Denver and Macon, very engaged residents who use the internet are more likely to consider it an important platform for local news than the somewhat and unengaged, and more so than the unengaged in Sioux City. One striking difference among the very engaged in Denver, compared with other cities, is their low evaluations of their local news sources. 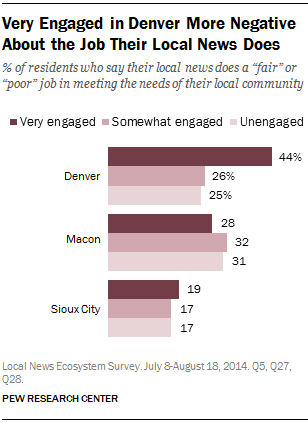 Fully 44% of very engaged Denver residents say that the local news media do a fair or poor job, compared with about a quarter of the somewhat engaged (26%) and the unengaged (25%). Further, about a quarter (24%) of very engaged Denver residents who have lived there at least five years say that the quality of local news coverage has declined in the past year, compared with 13% of the somewhat engaged and just 6% of the unengaged. In Macon and Sioux City, there is little difference in their evaluation of the job that the media are doing and whether the quality of local news coverage has gotten better or worse. As with civic engagement, there are clear relationships between thinking a city is an excellent place to live and connection to local news. In all three cities, those who describe their city as an excellent place to live are much more likely than others to think their local news media do an excellent job and to enjoy keeping up with local news. More than half of Sioux City (53%) and Macon residents (54%) who rate the city as excellent say the local media do an excellent job in meeting the needs of their community. That falls to about a quarter among those who say their city is a good place to live and just one-in-ten among those who say it is fair or poor. In Denver, the percentage are smaller overall, but there is a similar falloff—from 23% of those who describe Denver as an excellent place to live to just 13% among those who rate the city less than excellent. In Sioux City, and to a somewhat lesser degree in Denver and Macon, high ratings of the city as a place to live also connect closely with news habits. In Sioux City and Macon, those who rate their city as an excellent place to live are more likely to follow and discuss local news topics. For example, residents who rate Sioux City as an excellent place to live very closely follow on average 4.0 topics (compared with 2.5 of those who rate it as good and 2.3 of those who rate it as fair or poor). In Macon, those who gave the city an excellent rating average 4.9 topics that they follow very closely (compared with 3.5 who rate the city as good and 3.1 who rate it as fair or poor). Looking at the specific topics, Sioux City residents who rate the city as an excellent place to live very closely follow nine of the 12 topics at higher rates than those who rate the city as good or fair/poor. The same is true for often discussing seven of the topics. Some of the topics that stand out as having large differences between the most satisfied and those less satisfied include the local economy, local schools and education, and local government and politics. In Macon, those who rate the city as excellent are more likely than others to very closely follow eight of the 12 topics but to discuss only one of the topics at higher rates. There is a hint of a similar trend in Denver, but the difference between those who rate the city as excellent and those who rate it as less than excellent are not as pronounced as in the other two cities. This may be due to the large percentage of residents who rate their city as excellent compared with the other two cities. For the individual topics, those who give the city an excellent rating are more likely to very closely follow three topics and often discuss four topics at higher rates than those who rate the city as less than excellent. When it comes to the local news sources, newspapers again stand out. In Macon, for example, nearly two-thirds (65%) of those who rate the city as excellent often use The Telegraph for local news, compared with 41% of those who rate it as good and 26% of those who rate it as fair or poor. And in Denver, while fewer overall get news from the daily newspaper than in the other two cities, those who rate the city as excellent do turn to the Denver Post at a higher rate. In Sioux City, this pattern of greater news consumption among those who give their city the highest rating holds true for local TV, local radio, other local newspapers and magazines, local government agencies or officials, neighborhood associations or listservs, and other local residents. In other words, even if the mix of available outlets is not as great Sioux City as Denver, the residents there who give their city an excellent rating take fuller advantage of what’s there. It should be noted, though, that consistent with the finding that local TV rises to the top across all three cities, local TV news use across all levels of city satisfaction remains high. More than half of every group level of city satisfaction in each city said they often go to local TV for news.